One thing about bipolar disorder (at least mine) is that the pendulum swings both ways – into mania, where I want to read every book known to mankind and give my thoughts on it, and into depression, where I don’t want to even look at book. I am giving myself permission to let that be okay. I’m giving myself the permission to let reading remain a hobby I enjoy instead of a chore I force myself to do when I don’t want to. The pendulum is swinging back to a good place, and soon I’ll be able to enjoy it again. In the meantime, please know I haven’t abandoned this or my challenges. I just need a bit of time while my brain and my world right themselves! Fair warning: my bookshelves are a mess. The main bookshelf, plus some bookmarks I’ve had since high school. The Harry Potter books in their place of honor. Also see the Kindle and the bag of tarot cards! The bookshelf with the favorites: Amy Tan, Craig Johnson, and more. So those are my bookshelves. Now let’s talk about a couple of books that are on ’em! The truth is that a lot of my books are nonfiction, so I yanked some interesting ones that you probably wouldn’t expect to be on this blog. A couple of writing books, a craft book, a couple of comic books, and a couple of pagan/witchcraft books. No Plot? No Problem! 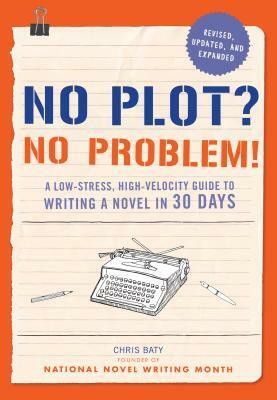 by Chris Baty is a handy dandy guide to writing a novel in thirty days. Specifically written for people who are doing National Novel Writing Month (find the link here), which I used to do every year. Those novels will never see the light of day, but there are plenty of writers who went on to be published, including Sara Gruen (Water for Elephants and At the Water’s Edge). One reason I like No Plot? is how succint it is. It walks you through the planning process, as well as how to manage your stress throughout the entire month. NaNoWriMo did a lot to turn me into the writer I am today! Have you ever had a word where you know what something is, but not what it’s called? 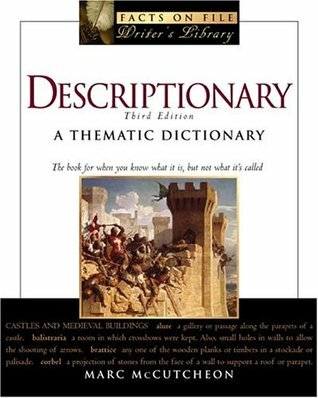 Then the Descriptionary is the perfect book for you. This thing is just plain neat – it’s got a ton of categories, it’s like a dictionary divided into categories like “Words about Words” and “Architecture” and so much more. I like to take a word at random and write a short story that involves that word. Seriously, if you write, this one’s a must-have. Listen, these two are both crochet books because that’s what I do in my spare time – I don’t go anywhere without yarn anymore. 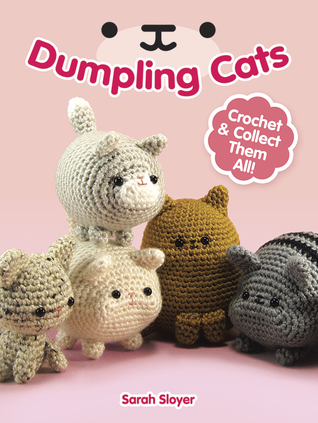 Dumpling Cats is the cutest crochet book I ever had the fortune to own (and I say had because, well, I lost it in the move from Portland and I’m waiting to buy a new one). It’s all about cute fat cats and reminds me a lot of Neko Atsume, the game, which I was obsessed with for awhile. Here is a dumpling kitty in the wild. 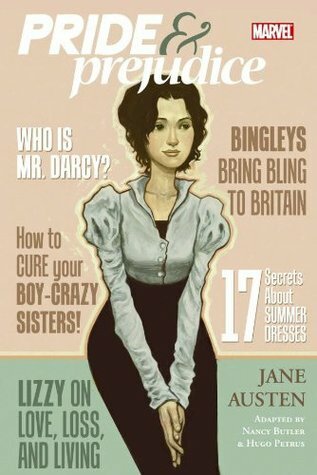 So I don’t enjoy reading Pride and Prejudice but I do enjoy the graphic novel. The art style is neat, and I actually want to read it, which is difficult to get me to do with classic novels. Fun fact: I accidentally stole this book from a friend of mine. Sorry, Hannah! 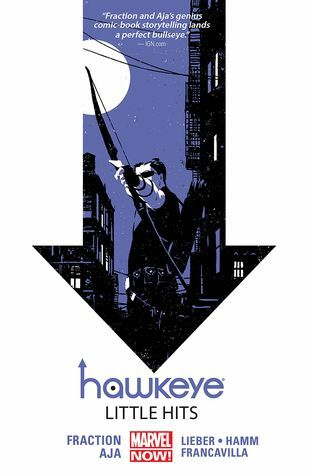 Listen, this is a hill that I will die on: Hawkeye is an underrated superhero. I’m also not talking about the mess that is the Marvel Cinematic Universe these days. Hawkeye is a character that (in Matt Fraction’s universe at least) struggles with depression, with adulting in general, and with being a hot mess. In multiple Marvel universes, Hawkeye/Clint Barton is also deaf. I’m really sad they pulled the plug on Matt Fraction’s Hawkeye, but I’ll always have the memories. 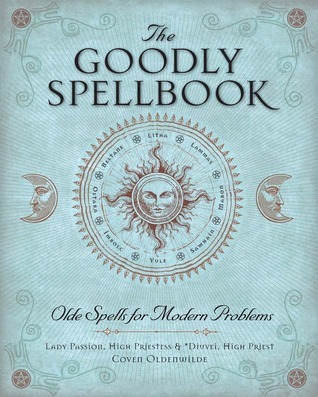 So this is an interesting book because it’s not just a book of spells. It actually goes into a lot of the theory and history behind how magic(k) works, and the first half of the book is devoted to it. A lot of times you’ll see new pagans and witches trying spells without knowing why they work – I was guilty of it too. Now I know how to make my own, and a lot of it is due largely to The Goodly Spellbook. I will warn you, it’s not secular – it’s based in Wicca beliefs. (For those wondering, I am Pagan, not Wiccan). 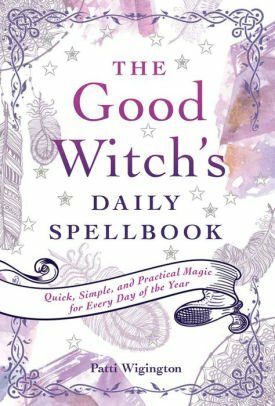 The Good Witch’s Daily Spellbook is designed to be simple, quick magic for every day of your life. It’s got a spell for every day of the year, and they’re all with low ingredients or easy to get ingredients (mine come mainly from the grocery store, I’ll admit it). My main complaint is that not all of the spells are useful on the day that they’re assigned, but that comes down to date correspondences and other things. Really, it is what you want to make it. So this is it, that’s a glance at my shelves. What’s on your shelf? So I’ve been writing for years. It’s my passion, my calling in life – I define myself as a writer before I define myself as anything. So I thought I’d talk about my writing a little. My first book was awful and now it’s out of print, thank goodness. You won’t catch me advertising it here because honestly it’s not worth reading. Well, my friend Jackie would disagree – apparently it made a splash on LGBT+ Twitter, but I wouldn’t know. If you’re interested, I’ll give you the link to the Goodreads page, as it’s under my real name, not my pen name. Now, I write on Wattpad. A lot of people think Wattpad is all for fanfiction, but that’s not true (and there’s nothing wrong with fanfiction – I also write fanfiction, just not on Wattpad). Wattpad is very much a community by writers, for writers. And I have a bunch up there. Here they are! 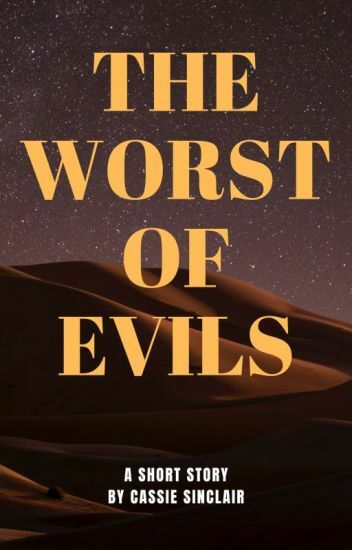 The Worst of Evils is a short story that I wrote first in senior year of high school, then polished it up into something decent later on – around 2015. It’s based around the idea of a dystopia where people are afraid of literature such as Shakespeare and the Bible. There’s heavy religious symbolism, not because I’m religious, but because it was a fun tool to use and I wanted to experiment with it. Warnings: Murder-suicide, a lot of religious symbolism, preachy writing. You can find The Worst of Evils here. So, little known fact about me is that I love poetry and lyrics and sometimes I write them. 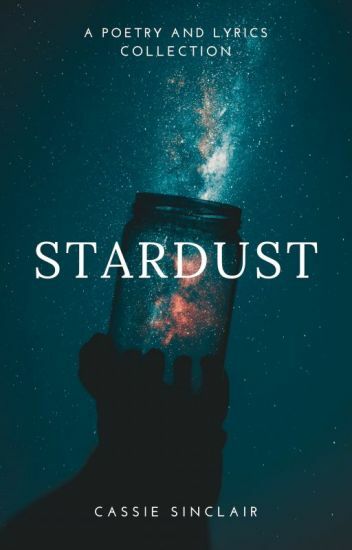 Stardust is a collection of poems that I’ve written, and I’m constantly adding to it – it’s ever-growing, so even though the collection is small now, it’s growing. You can find it here. 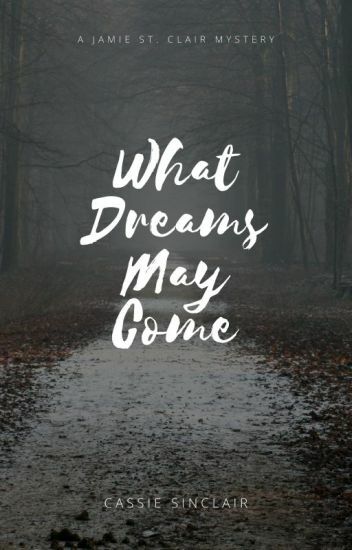 Last but not least is What Dreams May Come – it’s my murder mystery that I’m working on. Chapters 1-3 are up, and I’m hoping to get Chapter 4 up this week as I took the holidays off from working on it. The main character is a lesbian in a small town in Missouri (because small town Missouri culture is both universal and unique), a disgraced cop from Portland, who is desperate to prove herself and get back to the job that she loves. There’s also a serial killer, if that sweetens the pot for anyone. You can find it here. Warning: Murder, death, and dealing with dead bodies. So that’s it, that’s all my current writing. It’s all free to read, so feel free to take a look at anything, come back, and tell me what you think! Do you write? What do you write? I’ll be completely honest, I don’t read classics. I don’t work my way through the banned book list, I don’t make a conscious choice to pick up classic books. It’s not that I don’t like them – it’s just that a lot of time, I already have a massive TBR pile and I try really hard not to add to it. That’s why this discussion post is so important – it’s not often I read classics. So here it is, my list of favorite classic reads and why I love them. One, I love this book because I’ve read it six times. I did so under duress, in the middle of class, because I read faster than everyone else and the teacher wouldn’t let me whip out another book during Fahrenheit 451 time. The more that I read it, the more that I gleaned from it, symbolism-wise, and I realized that it’s actually an incredibly complex and nuanced novel. I knew it was a classic before, but reading it, I could tell why. It was timeless – it still is. 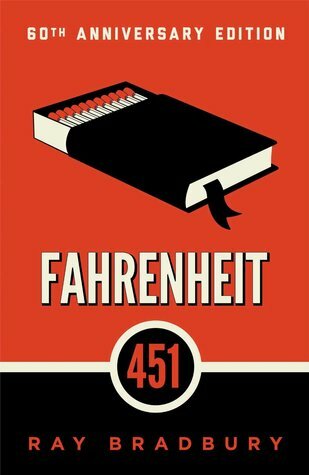 It also started my love for dystopian novels. I love Their Eyes Were Watching God more than I love almost any other book – maybe even my all-time favorite Perks of Being a Wallflower. Their Eyes is a book about starting over, a book about learning yourself, a book about going back to your roots and figuring out who you are and what you want. 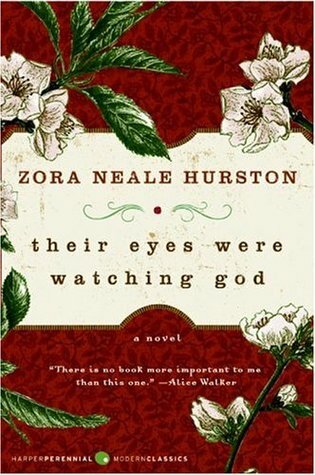 On top of that, it’s Zora Neale Hurston, who I love. Story time! So when I was in school, we participated in National History Day, and I wrote a huge, massive, highly-researched paper on the Harlem Renaissance. I learned a lot about a lot of authors and artists, but I became fascinated with Langston Hughes and Zora Neale Hurston. So when I started reading Their Eyes Were Watching God in high school, I knew it would be good, and meaningful, and everything a classic should be. I bet this one doesn’t make a lot of favorites lists – on the surface it’s a stuffy, overly done novel about Puritan beliefs. BUT on the inside, deep beneath the surface, you see a richly nuanced novel chock full of symbolism. 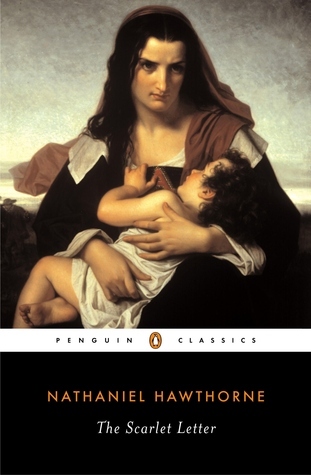 If you take the time to analyze it – like I had to for a class in college – The Scarlet Letter becomes a book about women’s rights in a highly oppressive time, the power and the weight of societal expectations, and the idea of living after essentially a traumatic event. Seriously, if you had to read it in school, try it as an adult. So that’s it, my quick list of classics that I enjoy. Honorable mentions include The Great Gatsby, The Princess Bride, and literally anything by William Shakespeare but especially The Tempest. Sorry, no cool header for this one! Also, I wrote this at like 2 am this morning, so it’s definitely honest. The main gist is that I loved this book. I was given an ARC of The Raven’s Tale in exchange for a fair and honest review, and I can honestly say that I am privileged to have been able to read it. The Raven’s Tale is an interesting look at what life could have been like for Edgar Allan Poe as a young man on the edge of adulthood, with a very cool twist – muses, like Edgar’s macabre, twisted look at life, can come to life, and his does in the form of a terrifying, macabre young lady. I was intrigued by this book when I saw it, because the cover is so very striking, and the synopsis had me hooked. I personally really enjoy Edgar Allan Poe, though I hadn’t read one of his works in years, and one thing I wish I had done before reading was refresh. It’s also important, I think, to point out how much reading this book made me want to go read an Edgar Allan Poe work. About halfway through, I began to feel like the plot was moving in circles: Lenore the muse appears in Edgar’s life and he rejects her. At this point I was hungry to start seeing them work together, but the plot picked up after that so I was satisfied. Overall, it’s a very good read – I was hooked, I wanted to know what happens, I was invested in the characters. The writing style and worldbuilding was entertaining and I just wish there were more of it, but that may take it from a YA novel up a notch to adult fiction. I also wish that it were written in a darker tone, just to enhance the morbidity and macabre sense of the muse, but again, that would take it up from a YA novel. 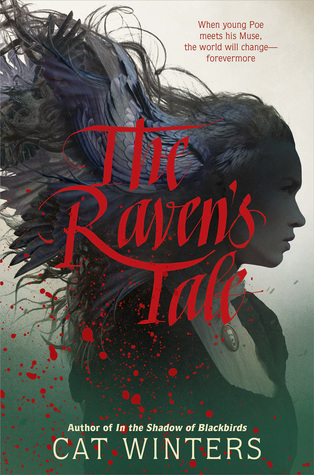 And it’s important to note that I’m not knocking The Raven’s Tale with these comments – I’m just saying that it leaves me craving another novel about Edgar Allan Poe and his muse, one suited a little more to my own tastes. That said, a very good book. I like the disconnect between who Edgar wants to be as a writer, who Lenore wants him to be as a writer, and who society wants him to be overall (I’m looking at you, John Allan). I really like the character writing – no one feels like a cardboard character unless they’re meant to be that way (like some of the boys at the University or characters in passing). Everyone who matters is well-rounded and well-written – even the characters you’re not meant to like. If you’re looking for a cool twist on a classic figure, then this is the book for you. Make sure to look for The Raven’s Tale from Cat Winters this April! I personally highly recommend it – it’s my first ARC I’ve had, and I was lucky to get such a good one. Alright, we all know what a guilty pleasure read is. It’s that one book – you know the one, with the characters not exactly written well, the plot full of holes, everyone hates it except, apparently, you. You don’t hate it. You love it. The thing about guilty pleasures is that they’re just that – pleasurable. And we as a society are against things purely for pleasure, sometimes. When you read, shouldn’t it be to advance yourself in some way? I don’t believe that. I believe in reading for any reason – enjoyment and pleasure is one of them. That’s why my motto (“Live Unapologetically” – I know, I keep harping on it, but it’s so useful!) comes in handy, because I’m refusing to read things I don’t enjoy. I refuse to limit myself to only “academic” reading, or reading for some kind of gain. No, if I want to read for the sheer joy of reading, if I want to read to indulge in some impossible romantic fantasy (oh my god, do I love cheesy romance novels, though), then I’m going to do it. Rant over. Let’s look at some of my favorite guilty pleasure reads. Now, by calling these “guilty pleasures” I don’t mean any kind of offense towards the books themselves.I just mean that they are books that I’ve read a thousand times for the ssheer joy of being able to read them. Listen, I loved Twilight, okay. I loved it. I was too cool in high school to love it when it came out, but I did read it (so I could make fun of it), and it shot to the very top of my guilty pleasure reading list. I read the whole series, I watched the movies (alone in my room, my friends were also too cool). I hadn’t yet learned that I could read a book purely for the enjoyment of the book – I didn’t have to analyze every little thing, I didn’t have to find meaning in every word. 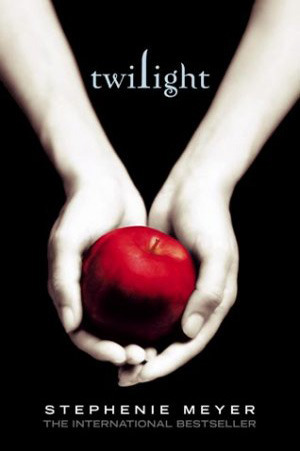 Twilight was, and still is, a favorite – right up there next to Perks of Being a Wallflower for me. 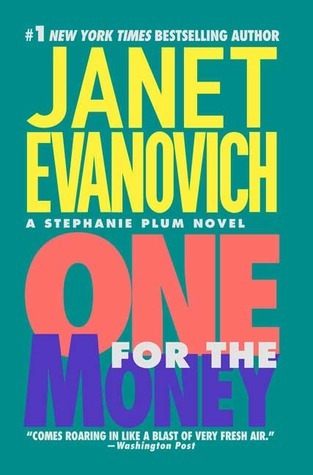 So, One for the Money and the Stephanie Plum series – one of the first “adult” (meaning geared for adults) books that I ever read. My mom read it first, and loved it, and now it’s a guilty pleasure because honestly, at this point, I’m over the love triangle, but I just. Keep. Reading. Ranger? Ranger is my ideal man. “Babe.” Mm. Give me more of that, please. You’d think I had enough with 25 books, but I haven’t. Even better are the holiday spin-offs with Diesel. So what are your guilty pleasure reads? What books do you keep coming back to, over and over again? Confession time: I’ve always wanted to be a book blogger. This may be a strange aspiration to some, but to me, book blogging always represented a marriage of the two things I loved the most: reading and writing. I’ve always been a writer, from the moment I could hold a pen (seriously, I wrote a book about a flower when I was four, my mom says it’s my first masterpiece). But before that, I was a reader, with my mom and by myself. The mom and the blogger in question. I’m the tater tot. Books offered an escape as a child – not from anything bad, but just because I loved them. Then, when I became a teenager, books offered a true escape from mental illness (undiagnosed and unnoticed at the time), loneliness, and a very unhealthy relationship. I hit college and thought that to be a book blogger, I needed some kind of credentials. Then I got into freelance writing and learned that I needed nothing to be a reviewer, and that people would pay for honest reviews. To be fair, though, I hated freelance writing because I couldn’t write what I wanted. And I hated writing reviews for money, because I couldn’t read what I wanted, which meant I didn’t enjoy the book, which meant a bad review. So let’s get to why I’m here today. To do that, we have to talk about a few things: Bipolar Disorder, rock bottom, and starting over. I am diagnosed bipolar 1, and I didn’t know this until a couple of weeks ago when I came home from Portland – I had left for Portland in April because I went manic. I won’t go into depth, but I will say that I had been manic for pretty much months, and that I made some horrible decisions and hurt some people. And when I realized that I had done things and hurt people, I threw everything in the car (a crappy ’97 Honda Accord station wagon instead of my beloved Jeep Liberty – another bad decision made in the throes of mania) and I drove 2000 miles home while recovering from sepsis and everything I had done. What didn’t fit in the car got left behind. And I immediately went into the hospital for my illness when I got to Missouri, and then immediately after that, inpatient. I have hit rock bottom. It tastes a little like cardboard and defeat, and a lot like lithium pills for me. Now for starting over. I’m lucky enough to have parents I can come home to. I’m lucky in that I have a job now, that I’ll be able to keep it because I’m on the right medication. I’m lucky to have a diagnosis that fits instead of one that hurts me (did you know that taking antidepressants if your bipolar can trigger mania? I do now). So what this book blog represents to me is starting over fresh. It’s being able to have an outlet and a hobby, and hopefully a community. Being mentally ill in the middle of Missouri is pretty tough, actually – not a lot of treatment options and not a lot of people willing and knowledgeable enough to help. But that’s what this blog means to me: a fresh start. What does book blogging mean to you?